I’ve been thinking about different ways to use zucchini since my two zucchini plants are covered in baby zucchini. It only takes a couple of days for them to mature – so soon there will be one or two zucchini ready to eat each day. I saw an interesting recipe for zucchini pickles which I want to try and if it’s any good I’ll share the recipe with you in the next week or so. In the meantime, I’ve made roasted zucchini. 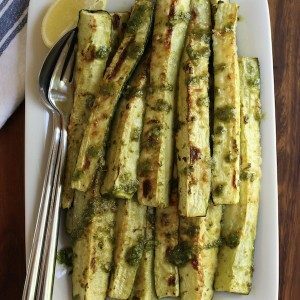 This is a very simple, straight forward recipe and because zucchini needs a little help in the flavor department, I’ve added an herby lemon sauce and some parmesan to give it a flavor boost. 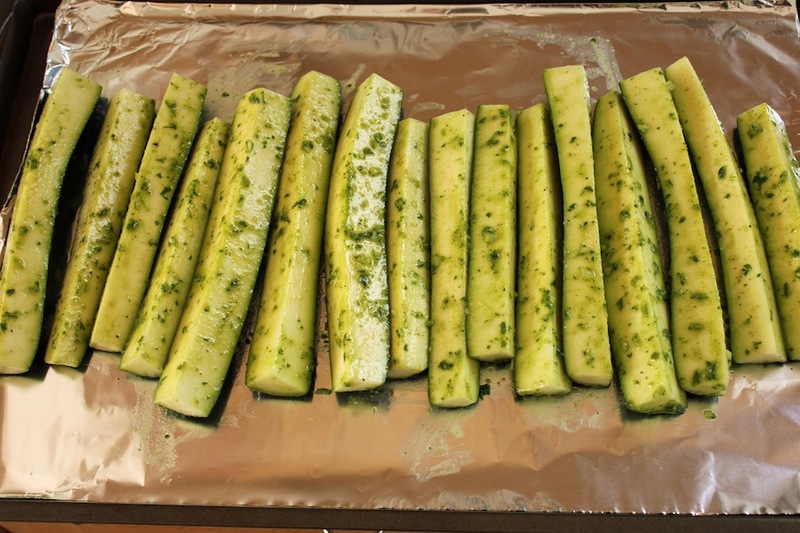 All you need to do is quarter the zucchini, toss them with the herb/lemon dressing and stick them in the oven. Roast them for a bit and then sprinkle them with parmesan and stick them under the broiler. Couldn’t be easier. To make the dressing use a blender. I tried to make it in a food processor but there wasn’t enough liquid to blend it properly. So don’t bother with the food processor – just throw it in the blender. My oven rack was in the middle of the oven so when I put the broiler on it took about 4 minutes for the cheese to melt and the zucchini to brown. 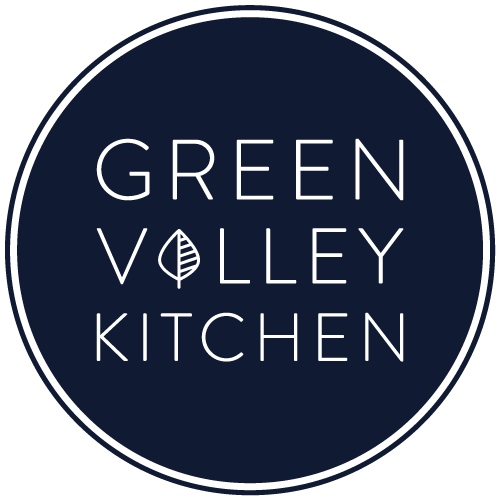 If your oven rack is closer to the broiler or if your broiler is at the bottom of your oven you will probably need less time – maybe only 2 minutes – so keep an eye on the zucchini so they don’t burn. Here’s the zucchini – tossed with the dressing and all ready for the oven. Make sure to line them up so they don’t overlap. A simple roasted zucchini – with a herby lemon dressing and parmesan. Slice zucchinis in to quarters – lengthwise. Put olive oil, lemon juice, herbs, minced garlic and pepper into a blender and puree until it forms a smooth dressing. Add 2/3 of the dressing in a bowl and toss with zucchini. Line a cooking sheet with tin foil. Place zucchini spears in a row – don’t overlap them. Remove zucchini from oven. Turn the broiler on. Sprinkle parmesan over the zucchini while it’s still on the baking sheet. Put the zucchini back in the oven – under the broiler. 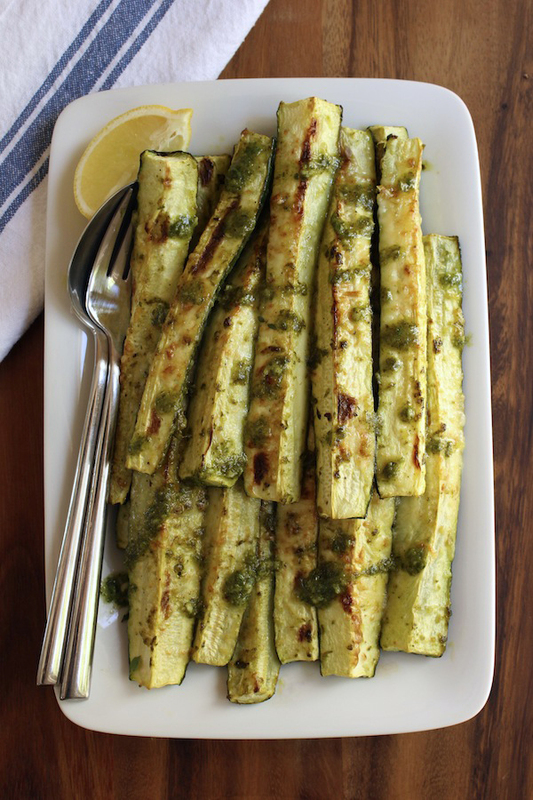 Broil from 2 to 4 minutes – until the zucchini and parmesan cheese start to brown. Remove from oven and put on a plate. Drizzle remaining 1/3 of dressing over the top of the zucchini.